I went to a high school where students were either rich or smart – preferably both. I wasn’t a stand-out in either category but my father had gone there and I wanted to follow in his footsteps. We also shared a love of running. Track was our sweet spot. My event was the 400 meter, known for its cruelty, because it’s too long to be a sprint and too short to be a distance race. The strategy is to run as though you’re being chased by hungry lions even though your lungs and guts twist into an agonizing knot until you collapse across the finish line. I loved it! The grand finale of a track meet is the 1600 meter relay. 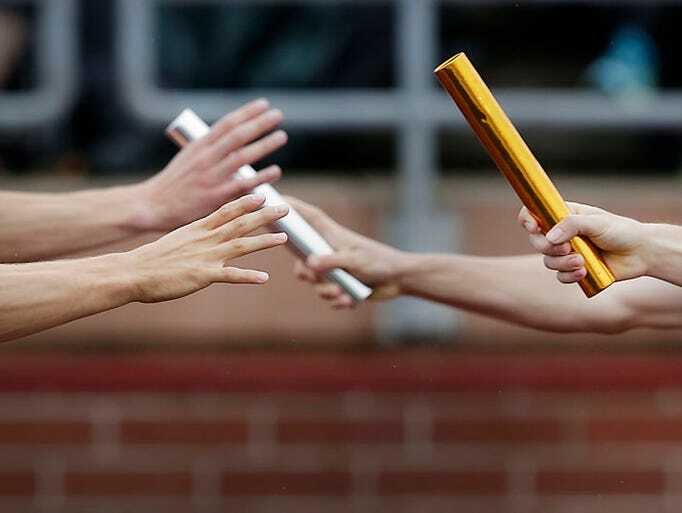 I was the anchor for our Varsity team, entrusted with the last handoff of the baton to carry it to victory. Looking back, my fondest memory wasn’t the sensation of flying around the track or leaning in to cross the finish line – it was my father’s booming voice, calling from the stands, “Bring it home, Mary Suzanne!” At times I’d overhear runners ask, “Who is Mary Suzanne?” He was loud and proud. In my four years on the team, I’d never run the first leg of the relay. As anchor, I was used to the carefully choreographed baton exchange in the inside lane. The first runner had to perfectly time her launch from the starting blocks with the blast of the gun and stay in her lane. As I crouched in the unfamiliar blocks, I was flustered but determined to do whatever it took to come in first. The gun went off and I exploded into a full sprint. Adrenalin and pressure were my rocket fuel. I had never felt faster. As I rounded the third turn, I began to pass all the other runners. But exhileration morphed into one of the most horrifying moments of my life to this day: I saw that each girl carried something that I did not – a baton. I had no choice but to keep sprinting around the track where I saw the second runner on my relay team with her hand outstretched. She smiled when she saw I was handing her the lead. The smile vanished when she saw that I wasn’t handing her a baton. We lamely slapped hands and she took off down the track only to be called back and told by the judge that our team was disqualified. Race lost. Meet lost. My dignity lost. The next day I had to carry a baton to all my classes and the coach kicked me off the Varsity team, replacing me for the trip to the state meet. I finished my Senior year on Junior Varsity. Did I mention it was a cruel event? Over the years, I’ve wanted to bury this humiliating story in my memory but God showed me how to use it to share the Gospel. Jesus had parables like The Prodigal Son and The Lost Coin. We are all born to the human race, running as fast as we can to be a winner. Our birth is the start and our death is the finish line. There is a Judge at the end of life’s race who will determine whether we’re qualified to go to Heaven or disqualified and go to Hell. And it doesn’t matter whether we finished first or dead last. What qualifies us for Heaven isn’t a baton, or wealth, or achievement, or denomination, or being a good person – it’s receiving God’s free gift of salvation, bought by Christ’s death on the cross as payment for our sins. How I wished my Dad was still alive to tell him that story. One day I will. In this season of life, I, wife of Fess (her Southern Gentleman), am running (get it – my story is about running) my three teenage daughters around in my aptly named, Odyssey. I’d be a hot mess without the godly women who have helped me grow up in life and faith: my beloved mom, Marie Niedringhaus, and my mentors Joan Kehr, Karen Bacon, and Ellen Mayes, with whom I co-founded Hidden Heart Ministry. I can be found teaching, talking, writing and pondering the mystery of how my mother kept a clean house, dinner every night, and always looked pretty. I’m pretty certain I missed my calling as a nail polish color namer (Rose Cuervo, Pinky Tuscadero, Cardinal Sin!). My heroes are homeschooling moms, room moms, and women who go to the gym before dawn.